Winter in the UK is a good time to go paddling. This is puzzling to my Canadian friends. As their canoes are being put away for the winter freeze, we are just getting warmed up for our paddling season. More water and fewer access hassles make for good days out in the canoe. The days are short though. And a dry suit is a good investment. Every year, usually in late November or early December, there is an open invite to the team from Frontier Bushcraft to head off for a long weekend of canoeing. We’ve worked together over the course of the year but this is purely recreational. This year, we took a long weekend out to go canoeing in various spots in North Wales. My good friend and paddling partner Ray Goodwin lives here and it’s a good chance for us all to go canoeing together. 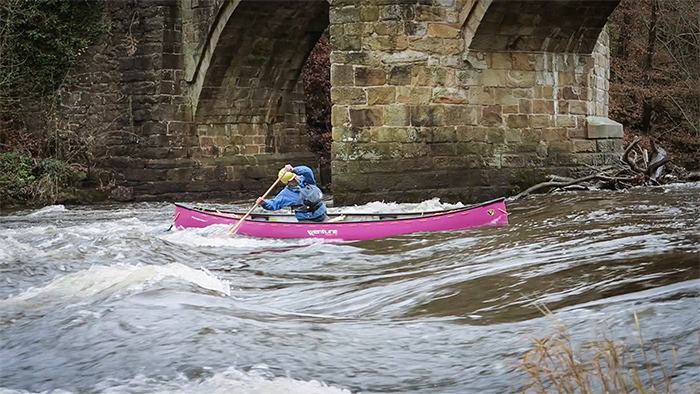 On the second day we hit the 16m (10 mile) section of the River Dee from Llangollen to Overton Bridge, a stretch which contains some nice white water, a great surf waves and some weirs that command respect. This section is crossed by the famous Pontcysyllte aquaduct, a World Heritage site. A varied route, some interesting features and finishing in the dusk, this day trip made the perfect December microadventure by canoe. Nice ritual. Wish I was there. My silly season ritual, friction fire. This year lime. Those weirs looked like a lot of fun! Lovely stretch of river too. What a lovely stretch of river, with good flow too! Looks like you had a great time. Thanks for sharing. I enjoyed watching it! Brilliant article – absolutely spot on.